The Buddhist school of Tiantai originated in late 6th century China. It became enormously influential until it was nearly wiped out by the Emperor's repression of Buddhism in 845. It barely survived in China, but it thrived in Japan as Tendai Buddhism. It also was transmitted to Korea as Cheontae and to Vietnam as Thien Thai tong. Tiantai was the first school of Buddhism to consider the Lotus Sutra to be the most cumulative and accessible expression of the Buddha's teaching. It is also known for its doctrine of the Three Truths; its classification of Buddhist doctrines into Five Periods and Eight Teachings; and its particular form of meditation. A monk named Zhiyi (538-597; also spelled Chih-i) founded Tiantai and developed most of its doctrines, although the school considers Zhiyi to be either its third or fourth patriarch, not the first. Nagarjuna is sometimes considered the first patriarch. A monk named Huiwen (550–577), who may have first proposed the Three Truths doctrine, is sometimes considered the first patriarch and sometimes the second, after Nagarjuna. The next patriarch is Huiwen's student Huisi (515-577), who was the teacher of Zhiyi. Zhiyi's school is named for Mount Tiantai, which is located in what is now the eastern coastal province of Zhejiang. The Guoqing Temple on Mount Tiantai, probably built shortly after Zhiyi's death, has served as the "home" temple of Tendai through the centuries, although today it is mostly a tourist attraction. After Zhiyi, Tiantai's most prominent patriarch was Zhanran (711-782), who further developed Zhiyi's work and also raised the profile of Tiantai in China. The Japanese monk Saicho (767-822) came to Mount Tiantai to study. Saicho established Tiantai Buddhism in Japan as Tendai, which for a time was the dominant school of Buddhism in Japan. In 845 the Tang Dynasty Emperor Wuzong ordered all "foreign" religions in China, which included Buddhism, to be eliminated. Guoqing Temple was destroyed, along with its library and manuscripts, and the monks scattered. However, Tiantai did not become extinct in China. In time, with the help of Korean disciples, Guoqing was rebuilt and copies of essential texts were returned to the mountain. Tiantai had regained some of its footing by the year 1000, when a doctrinal dispute split the school in half and generated a few centuries' worth of treatises and commentaries. By the 17th century, however, Tiantai had become "less of a self-standing school than a set of texts and doctrines in which some scholars might choose to specialize," according to British historian Damien Keown. The Three Truths doctrine is an expansion of Nagarjuna's Two Truths, which proposes that phenomena "exist" in both an absolute and a conventional way. Since all phenomena are empty of self-essence, in conventional reality they take identity only in relation to other phenomena, while in the absolute phenomena are undistinguished and unmanifested. The Three Truths proposes a "middle" acting as an interface of sorts between the absolute and the conventional. This "middle" is the omniscient mind of Buddha, which takes in all phenomenal reality, both pure and impure. Zhiyi was confronted with a contradictory mess of Indian texts that had been translated into Chinese by the end of the 6th century. Zhiyi analyzed and organized this confusion of doctrines using three criteria. These were (1) the period in the Buddha's life in which a sutra was preached; (2) the audience that first heard the sutra; (3) the teaching method the Buddha used to make his point. Zhiyi identified five distinct periods of the Buddha's life, and sorted texts accordingly into the Five Periods. He identified three kinds of audiences and five kinds of methods, and these became the Eight Teachings. This classification provided a context that explained discrepancies and synthesized the many teachings into a coherent whole. 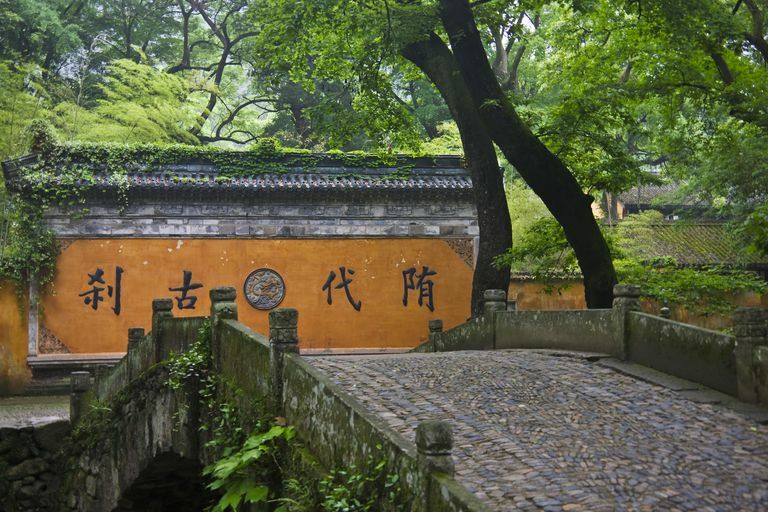 Although the Five Periods are not historically accurate, and scholars of other schools might differ with the Eight Teachings, Zhiyi's classification system was internally logical and gave Tiantai a solid foundation. Zhiyi and his teacher Huisi are remembered as meditation masters. As he did with Buddhist doctrines, Zhiyi also took the many techniques of meditation being practiced in China and synthesized them into a particular meditative path. This synthesis of bhavana included both samatha (peaceful dwelling) and vipassana (insight) practices. Mindfulness in both meditation and daily activities is emphasized. Some esoteric practices involving mudras and mandalas are included. Although Tiantai may have faded as a school in its own right, it had an enormous impact on other schools in both China and, eventually, Japan. In different ways, much of Zhiyi's teaching lives on in Pure Land and Nichiren Buddhism, as well as Zen. What is Linji Chan Buddhism? What Is Mahayana Buddhism? How Does It Differ From Theravada Buddhism? What Is Nondualism in Mahayana Buddhism and Why Is It Important?